This will be the first of our visits to St Mary’s, Luton’s historic church situated in the heart of the town. 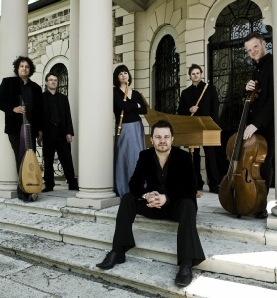 Its resonant acoustic will be at the service of a programme entitled Old Wine in New Bottles. Under the dynamic leadership of Julian Perkins, the strings and harpsichord of Sounds Baroque with baritone Ed Ballard, present a pair of Handel’s dramatic cantatas alongside the more contemporary Jove’s Nod by Stephen Dodgson, a one time vice-president of the club. They will also play a trio sonata inspired by the thriving Early Music scene that was emerging in Eastern Europe in the late 17th and 18th Centuries.